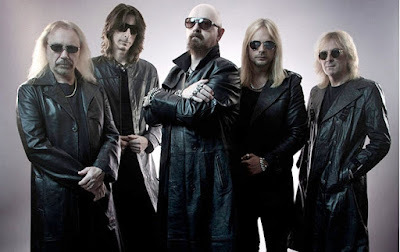 Judas Priest continued their world tour in support of 2014’s “Redeemer Of Souls” in February with dates in Australia, New Zealand, Japan and South Korea. The project delivered the UK metal legends the first US Top 10 of their career when it debuted at No. 6 on the US Billboard 200 upon its release. The record marked guitarist Richie Faulkner's studio debut with Priest; he replaced founding member K.K. Downing following his retirement in 2011. The 3CD set included a remastered version of the album along with a complete live recording from the ‘Defenders’ tour from the Long Beach Arena in California. Preist were inducted into the Wisconsin Area Music Industry Awards (WAMI) Hall of Fame during a ceremony at the Turner Hall Ballroom in Milwaukee on April 19. The event, which recognizes achievements in 34 music categories, saw the group honored as the first recipient of a Global “Honorary” WAMI Hall Of Fame induction. A series of South American shows on the 40th anniversary tour in April were followed by a short North American run that included six US dates in May before the band returned to Europe to perform throughout the summer. In October, Priest played a month-long run in North America and then closed out their 2015 live schedule with four week of dates in Europe that included six UK concerts. According to frontman Rob Halford, plans for 2016 include a return to the studio. “We have such an incredible reaction to Redeemer Of Souls that that really motivated us to crack the whip and get on with making the next record pretty quickly,” Halford told Sixx Sense With Nikki Sixx co-host Jenn Marino. “The clock is ticking, you know. We can’t afford to wait three years, or five years now, to make the record. "And especially while we’re having this great, kind of vibe with the fans and just this massive Priest family love fest type of deal."